This project ended successfully on 11/1/2016 12:00! Invitation to the opening and you get the chance to shoot a photo of yourself with Eugene our mascot. Invitation to the opening and a free drink at your choice. Enjoy a weekend afternoon with Albert Nyberg in Basel, completing the day with a BBQ! Invitation to the opening with a free drink at your choice. Enjoy a weekend afternoon with Ruben Alcatara in Basel, completing the day with a BBQ! Invitation to the opening, a free drink at your own choice, an invitation to a photo shooting at the temporary hall. The best picture will be framed and handed over to you. Wir sind die Köpfe hinter dem Verein Trendsport. 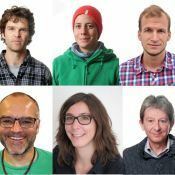 Corinne von der CMS, Karin die BMX-Begeisterte Betriebsleiterin, Oli vom Sportamt BS, Alain & Roger von der JuAr Basel und Oli der Skateboard-Aktivist. Wir setzen uns für sinnvolle und sportliche Freizeitangebote für Kinder, Jugendliche und junge Erwachsene ein.